UCLA physicists have proposed new theories for how the universe’s first black holes might have formed and the role they might play in the production of heavy elements such as gold, platinum and uranium.Two papers on their work were published in the journal Physical Review Letters. The researchers began by considering that a uniform field of energy pervaded the universe shortly after the Big Bang. Scientists expect that such fields existed in the distant past. After the universe rapidly expanded, this energy field would have separated into clumps. Gravity would cause these clumps to attract one another and merge together. The UCLA researchers proposed that some small fraction of these growing clumps became dense enough to become black holes.Their hypothesis is fairly generic, Kusenko said, and it doesn’t rely on what he called the “unlikely coincidences” that underpin other theories explaining primordial black holes.The paper suggests that it’s possible to search for these primordial black holes using astronomical observations. 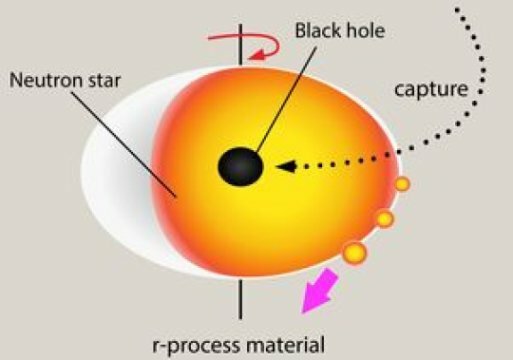 One method involves measuring the very tiny changes in a star’s brightness that result from the gravitational effects of a primordial black hole passing between Earth and that star. Earlier this year, U.S. and Japanese astronomers published a paper on their discovery of one star in a nearby galaxy that brightened and dimmed precisely as if a primordial black hole was passing in front of it.In a separate study, Kusenko, Volodymyr Takhistov, a UCLA postdoctoral researcher, and George Fuller, a professor at UC San Diego, proposed that primordial black holes might play an important role in the formation of heavy elements such as gold, silver, platinum and uranium, which could be ongoing in our galaxy and others.The origin of those heavy elements has long been a mystery to researchers.“Scientists know that these heavy elements exist, but they’re not sure where these elements are being formed,” Kusenko said. “This has been really embarrassing.”The UCLA research suggests that a primordial black hole occasionally collides with a neutron star — the city-sized, spinning remnant of a star that remains after some supernova explosions — and sinks into its depths.When that happens, Kusenko said, the primordial black hole consumes the neutron star from the inside, a process that takes about 10,000 years. As the neutron star shrinks, it spins even faster, eventually causing small fragments to detach and fly off. Those fragments of neutron-rich material may be the sites in which neutrons fuse into heavier and heavier elements, Kusenko said.However, the probability of a neutron star capturing a black hole is rather low, said Kusenko, which is consistent with observations of only some galaxies being enriched in heavy elements. The theory that primordial black holes collide with neutron stars to create heavy elements also explains the observed lack of neutron stars in the center of the Milky Way galaxy, a long-standing mystery in astrophysics.This winter, Kusenko and his colleagues will collaborate with scientists at Princeton University on computer simulations of the heavy elements produced by a neutron star-black hole interaction. By comparing the results of those simulations with observations of heavy elements in nearby galaxies, the researchers hope to determine whether primordial black holes are indeed responsible for Earth’s gold, platinum and uranium.